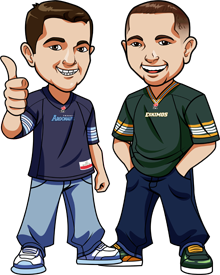 We’re Graeme(Eskimos fan) and Scott(Argos fan), two huge CFL fans who also bet sports for a living, and we’re here to provide you with everything CFL betting related. From CFL betting tips to the best CFL betting odds – we’ve got you covered. During the off-season check our CFL Blog for some fun content. And we’ve gone one better – we’ve teamed up exclusively with a top CFL linesmaker to bring you the best betting tips possible. You know the guys who set the point spreads and over/unders? Well we’re working with one of the primary guys who does just that. We sit down with him each week and he explains to us the lines that he picked, and WHY he picked them. This way – not only do we have our own expert analysis from years of betting and watching CFL – but we don’t miss out on anything! We get the information straight from the top and we might notice things that the linesmaker has missed, or learn some valuable information that we weren’t aware of. So stick with BetCFL.net for the best CFL Betting Tips & Picks. Quick note for people from United States: Be sure to subscribe to our weekly CFL tips, because not only will you get the tips e-mailed to you every week but we're working on some special mailing list exclusive bonuses and free bets only for people from United States. Graeme is an Eskimos fan, and Scott is an Argonauts fan. We’ve been CFL fans for years, and also betting sports for years as well. We run various other betting tips websites for the NBA, NHL, NFL and even the WNBA. Graeme has been a professional sports better for over 10 years. This is what we do for a living. It’s not a part-time job for us. We live, love and breathe sports and especially the CFL. We watch each CFL game 2-3 times a week both enjoying it and analyzing it. We fly all over Canada to attend games. We get together and spend hours debating the games each week before providing our expert analysis and CFL Betting Tips. And as mentioned above – we have a top CFL Linesmaker who provides us with some valuable insight. It’s amazing the stuff he will pick up on that we, and sites like TSN, have missed. On the flip side there is information that he doesn’t factor in which we do, and can give us an edge. Our job is simple: to provide you with the best CFL Betting Tips for free. That’s right; free CFL Betting Tips. We’re not charging for these. If anything it helps us – writing everything down and putting it out there for the public to read really helps us. We also offer live CFL Betting Tips – this is CFL Betting Tips offered during the game. So if the Argonauts are down 14-0 early in the 1st, we still might see value on them against the Tiger-Cats. So we’ll tweet and post on facebook to take the Argonauts and you can follow us and do that. (1) Like us on Facebook or follow us on Twitter. (2) Have an account at Bovada for Americans and Sports Interaction for everyone else. Bovada for Americans and Sports Interaction for everyone else offer live betting during the games. Even better? They have a really sick mobile website so you can bet from your cellphone. How awesome is that? This is something we’ve used for years – if we’re at a bar watching the game or even at a game live we’re always on our iPhones(Scott) or S4(Graeme) placing bet after bet after bet. So stay tuned to BetCFL.net – we aim to provide you the best CFL Betting Tips possible.